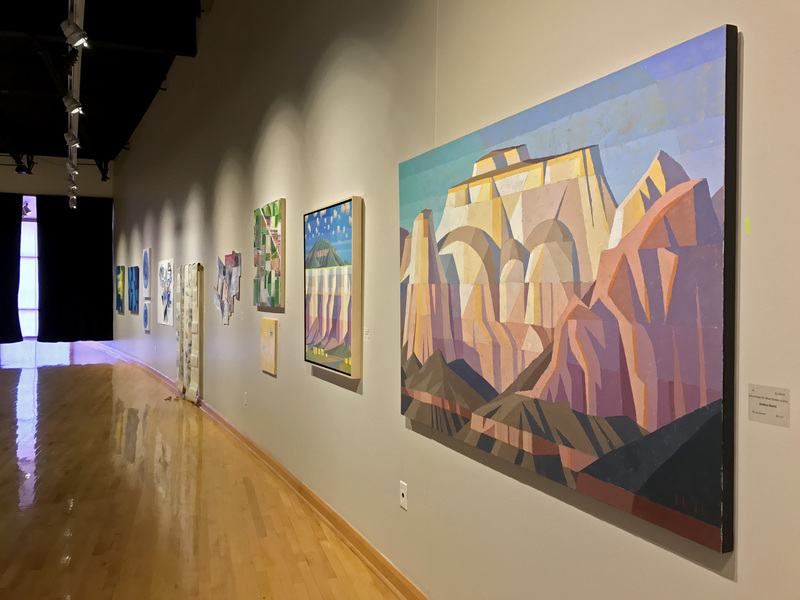 “Mapping: The Poetics of Utah Expression” is currently on display at Dixie State University’s Sears Art Museum Gallery in the Eccles Fine Arts Center. I finally got around to seeing my co-exhibit. OK, so really, mine is the little brother exhibit to the big sister in the Sears Art Museum Gallery. Titled “Mapping: The Poetics of Utah Expression,” it’s a surprisingly vibrant, diverse and intriguing show. In my opinion, it’s one of the best to come through the Dixie State University’s primary art gallery in the past decade. “Not To Touch The Earth” by Ike Bushman. The bulk of the show features paintings but there are some three-dimensional images like Ike Bushman’s captivating work, which is only enhanced by the gallery lighting. “Study of a Field #16” by Adam Bateman. Much of the work is conceptual and among the most intriguing concepts was Adam Bateman’s field series. Two of the pieces were on display, including #16 above. Information near the painting indicates that Bateman based these paintings on the marks created by farmers irrigating, plowing, planting and harvesting. Six graphite drawings by Stefanie Dykes. Stefanie Dykes’ dynamic graphite drawings also caught my eye. The six pieces here work together beautifully. “Look at Me” by Steven Stradley. “Hot Breath” by Abraham McCowan. “A Room for Innocence” by Corey Strange. This installation caught me off-guard. Corey Strange is known for doing experimental art installations and I wasn’t sure what to think about this one at first. It’s basically vinyl tablecloths taped over the gallery’s west windows to create an environment of color. But there’s intellectually much more going on than taped tablecloths. You’ll have to go and read his artist statement, posted at the entrance to the installation, to fully understand. “Geode Fade” (top) and “Geode Aqua” by Havoc Hendricks. “Geode Fade” literally stopped me in my tracks. I was walking through the exhibit, giving a quick look to most of the pieces and this was the first one to stop me and make me realize I needed to spend some time here. The illusion of depth in this top piece, especially, was stunning. Well done, Havoc Hendricks. “Roots” (top) and “Manifest Destiny” by Justin Wheatley. And I was ecstatic to finally see some pieces by Justin Wheatley in person. I’ve been following this artist on Instagram for a couple of years. Initially I was merely intrigued by his work, which often appears simplistic at first. But the more I saw of it, the more I was drawn in. His sense of design and composition is top notch. So, if you do stop by my “Connecting Paths” exhibit, make sure to also check out “Mapping: The Poetics of Utah Expression” (or vice-versa, of course). I’m obviously biased about my own exhibit, but “Mapping” is definitely worth the visit on its own. Both are located in DSU’s Eccles Fine Arts Center, 155 S. University Avenue, St. George. My exhibit is open any time the Eccles building is open but the Sears Art Museum Gallery hours are 9 a.m. to 5 p.m. Monday through Friday.